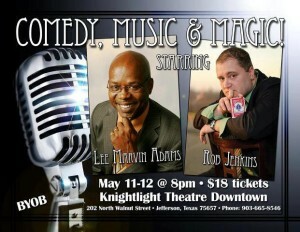 Comedy and Magic coming to Jefferson Texas for Mother's Day Weekend 2012. The new KnightLight Theater is bringing an evening of Comedy and Magic to Jefferson Texas for Mother’s Day weekend. It’s a great place for Mom to have a fabulous night out! 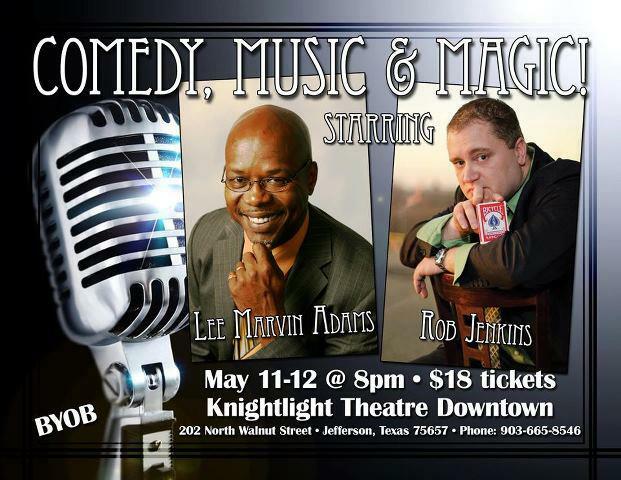 This special Comedy and Magic show Mother’s Day Weekend, featuring Rob Jenkins and Lee Marvin Adams in a two night, two person laugh it up event. May 11th and 12th at 8pm each night. The KnightLight Theater offers a menu of desserts and cheese trays along with full concession available. BYOB Wine Friendly.